Urbanized may not have been the strongest film I saw at Toronto in 2011, but it’s one of my most frequently remarked-upon. Director Gary Hustwit concludes his “design trilogy” with this film. It follows Helvetica and Objectified, each with a clean, crisp look, heavy on talking heads and videotaped examples of design. For Urbanized, Hustwit interviews city planners, academics, and architects who have thought a lot about how spaces interact with we human beings. For example, the former mayor of Bogotá speaks of financial constraints. So what do you do with limited resources? First, you prioritize. Before spending money on roads, build public transit and bikeways. To discourage traffic, stop pretending that there is a human right to parking. And since Bogotá is still growing, don’t spend money on a subway with fixed tracks, but rather on a bus-based subway-like system where once you pass the turnstile, you are in the system and can transfer to your heart’s content. No need for one-by-one boarding of buses; just step on when the doors open as though it were a subway car. And twenty years hence, if the population centers have moved, you’re not married to fixed tracks. Urbanized continues with other examples from around America and around the world. Copenhagen switches bike lanes and parking lanes so that the parked cars protect the bicycles, and not vice-versa. 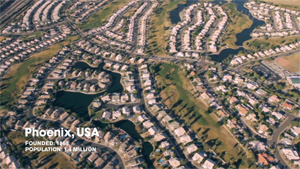 There is a section on sprawl, and Phoenix is the poster child. Luckily, the film finds a Phoenix city planner who says he loves his lawn and his car and his neighborhood, and he wouldn’t trade it for any city in the world. Even shrinking Detroit gets kudos for shrinking in a smart way and maintaining a sense of community. For contrast, there are a few examples of what not to do. Shanghai is dominated by multi-lane highways, which divides the city with an impassable barrier. If they’d had it to do over again, they would have done things differently. And Brasilia! Oh, Brasilia. You were designed as a city of the future and, as Jan Gehl says, you look gorgeous from an airplane. But get down at ground level and you’re not very hospitable to people at all. Toward the end, Urbanized seems to lose focus. New ideas are introduced, but they aren’t necessarily woven into a coherent whole. It becomes difficult to imagine each city’s particular challenge as part of a larger thesis. Reducing energy consumption in Brighton and reducing crime in South Africa are useful goals but by the end, they start to seem seem tacked on. I went through my “urban planning” craze a few years ago, thanks to a brother in the business and an uncle who trained as an architect, and I can say that Urbanized is a good (and great-looking) overview of the ideas that go into urban planning. And if you like Urbanized, let me pass along two amazing book recommendations from my uncle: Christopher Alexander’s The Timeless Way of Building and A Pattern Language, which together paint a much more detailed picture of how people can and should create the spaces that they inhabit.